BIGGER AND BOLDER!! 6.2L ECOTEC3 V8!! ALL NEW REDESIGN!! LTZ CREW!! 4WD!! 5.3L V8!! Z71!! HEATED/COOLED LEATHER!! LTZ PLUS PACKAGE!! MAX TRAILERING PACKAGE!! POWER LIFTGATE!! 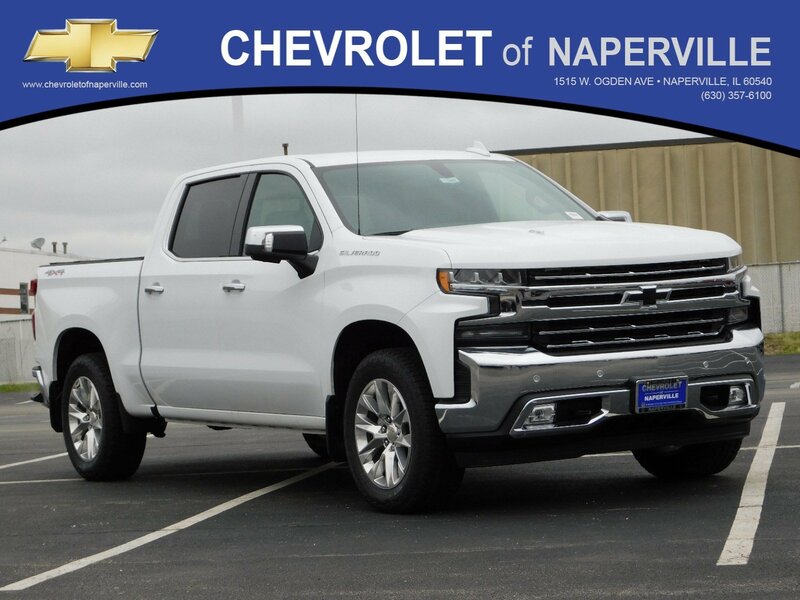 2019 CHEVROLET SILVERADO 4WD LTZ CREW, SUMMIT WHITE OVER GIDEON/VERY DARK ATMOSHPHERE HEATED/COOLED LEATHER SEATING, BLACK BOWTIE EMBLEM PACKAGE, BEST COLOR COMBO IN THE UNIVERSE!! 6.2L ECOTEC3 V8 ENGINE WITH DYNAMIC FUEL MANAGEMENT, 10-SPD AUTOMATIC TRANSMISSION, ADVANCED TRAILERING SYSTEM WITH HITCH GUIDANCE, LETS GO OVER ALL THE OPTIONS ON THIS ALL NEW REDESIGN, POWER GLASS SUNROOF, 8 INCH COLOR TOUCH SCREEN WITH INFOTAINMENT AND VOICE RECOGNITION, LTZ PLUS PACKAGE INCLUDES: FRONT BUCKET SEATING WITH HEATED AND COOLED LEATHER SEATING, REAR SLIDING POWER WINDOW, UNIVERSAL HOME REMOTE, 2 USB PORTS, HEATED SECOND ROW SEATING, FRONT AND REAR PARKING ASSIST, LANE CHANGE ALERT WITH SIDE BLIND ZONE ALERT, AND REAR CROSS TRAFFIC ALERT, MAX TRAILERING PACKAGE INCLUDING: REVISED SHOCK TUNING, ENHANCED COOLING RADIATOR, HEAVY DUTY REAR SPRINGS, FACTORY TRI-FOLD HARD TONNEAU, SPRAY-ON BEDLINER…WE GOT MORE SILVERADO SHOPPERS…HD REAR VISION CAMERA, FOR THE FIRST TIME CHEVY POWER REAR TAILGATE, TRAILER CAMERA PACKAGE INCLUDING: LEFT AND RIGHT SIDE MIRROR CAMERAS, TRAILER VIEW CAMERA PROVISIONS… LED DURABED LIGHTING, FRONT LED FOG LIGHTS, 20 INCH POLISHED FINISHED RIMS, DRIVER MEMORY SEATING AND MIRRORS, DRIVER AND PASSENGER 10-WAY POWER SEATING, REMOTE VEHICLE STARTER, KEYLESS ENTRY WITH PUSH BUTTON START, LOADED UP AND READY TO GO TO WORK FOR YOU!! NOW…HOW ABOUT SOME WARRANTY…..YOU GET A 36 MONTH OR 36,000 MILE BUMPER TO BUMPER COVERAGE GOOD FROM THE DAY YOU TAKE DELIVERY, PLUS 5 YEAR OR 60,000 MILE POWERTRAIN COVERAGE!! 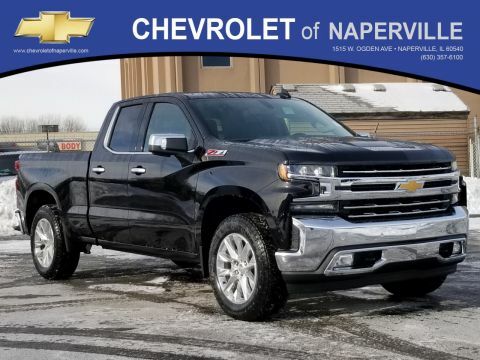 ONLY THING LEFT FOR YOU TO DO IS COME ON DOWN TO CHEVROLET OF NAPERVILLE AND TAKE THIS LOADED UP LTZ FOR A SPIN AROUND OUR WORLD FAMOUS CHEVROLET OF NAPERVILLE TEST TRACK!! 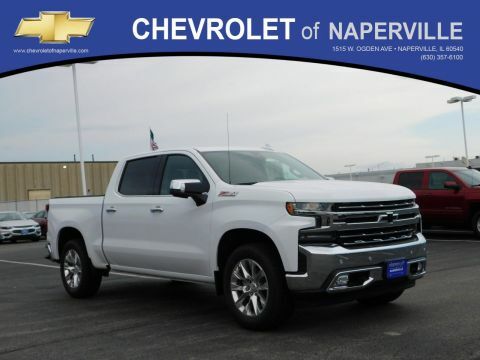 FIRST ONE HERE WINS…SEE YA SOON…FIND NEW ROADS HERE AT CHEVROLET OF NAPERVILLE….. Price includes all rebates in lieu of special financing their may be other rebates that you qualify for. Please call $2,000 – Chevrolet Conquest Purchase Private Offer. Exp. 04/30/2019 Must finance through General Motors Finance. BIGGER AND BOLDER!! 6.2L ECOTEC3 V8!! ALL NEW REDESIGN!! LTZ CREW!! 4WD!! 5.3L V8!! Z71!! HEATED/COOLED LEATHER!! LTZ PLUS PACKAGE!! MAX TRAILERING PACKAGE!! POWER LIFTGATE!! 2019 CHEVROLET SILVERADO 4WD LTZ CREW, SUMMIT WHITE OVER GIDEON/VERY DARK ATMOSHPHERE HEATED/COOLED LEATHER SEATING, BLACK BOWTIE EMBLEM PACKAGE, BEST COLOR COMBO IN THE UNIVERSE!! 6.2L ECOTEC3 V8 ENGINE WITH DYNAMIC FUEL MANAGEMENT, 10-SPD AUTOMATIC TRANSMISSION, ADVANCED TRAILERING SYSTEM WITH HITCH GUIDANCE, LETS GO OVER ALL THE OPTIONS ON THIS ALL NEW REDESIGN, POWER GLASS SUNROOF, 8 INCH COLOR TOUCH SCREEN WITH INFOTAINMENT AND VOICE RECOGNITION, LTZ PLUS PACKAGE INCLUDES: FRONT BUCKET SEATING WITH HEATED AND COOLED LEATHER SEATING, REAR SLIDING POWER WINDOW, UNIVERSAL HOME REMOTE, 2 USB PORTS, HEATED SECOND ROW SEATING, FRONT AND REAR PARKING ASSIST, LANE CHANGE ALERT WITH SIDE BLIND ZONE ALERT, AND REAR CROSS TRAFFIC ALERT, MAX TRAILERING PACKAGE INCLUDING: REVISED SHOCK TUNING, ENHANCED COOLING RADIATOR, HEAVY DUTY REAR SPRINGS, FACTORY TRI-FOLD HARD TONNEAU, SPRAY-ON BEDLINER...WE GOT MORE SILVERADO SHOPPERS...HD REAR VISION CAMERA, FOR THE FIRST TIME CHEVY POWER REAR TAILGATE, TRAILER CAMERA PACKAGE INCLUDING: LEFT AND RIGHT SIDE MIRROR CAMERAS, TRAILER VIEW CAMERA PROVISIONS... LED DURABED LIGHTING, FRONT LED FOG LIGHTS, 20 INCH POLISHED FINISHED RIMS, DRIVER MEMORY SEATING AND MIRRORS, DRIVER AND PASSENGER 10-WAY POWER SEATING, REMOTE VEHICLE STARTER, KEYLESS ENTRY WITH PUSH BUTTON START, LOADED UP AND READY TO GO TO WORK FOR YOU!! NOW...HOW ABOUT SOME WARRANTY.....YOU GET A 36 MONTH OR 36,000 MILE BUMPER TO BUMPER COVERAGE GOOD FROM THE DAY YOU TAKE DELIVERY, PLUS 5 YEAR OR 60,000 MILE POWERTRAIN COVERAGE!! 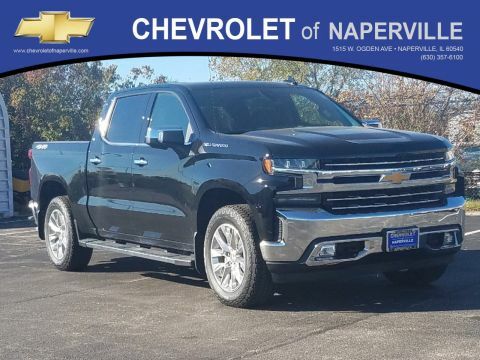 ONLY THING LEFT FOR YOU TO DO IS COME ON DOWN TO CHEVROLET OF NAPERVILLE AND TAKE THIS LOADED UP LTZ FOR A SPIN AROUND OUR WORLD FAMOUS CHEVROLET OF NAPERVILLE TEST TRACK!! 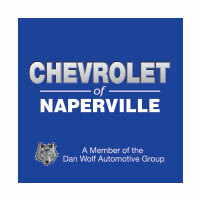 FIRST ONE HERE WINS...SEE YA SOON...FIND NEW ROADS HERE AT CHEVROLET OF NAPERVILLE..... Price includes all rebates in lieu of special financing their may be other rebates that you qualify for. Please call $2,000 - Chevrolet Conquest Purchase Private Offer. Exp. 04/30/2019 Must finance through General Motors Finance.